LiveScore.Editor which is the actual music editor. The LiveScore.Editor device has a graphical user interface that offers a number of convenient tools; among them: intelligent transcription with key and clef finder, a percussion map, a set of menus and palettes for easy navigation and interactive editing as well as microtonal notation and playback via LiveScore devices. We are going to walk you through the first steps of using LiveScore. Let’s start by opening a Live Set named LiveScore Demo-9.7.als which you should find in User Library>LiveScore. This may take a while. 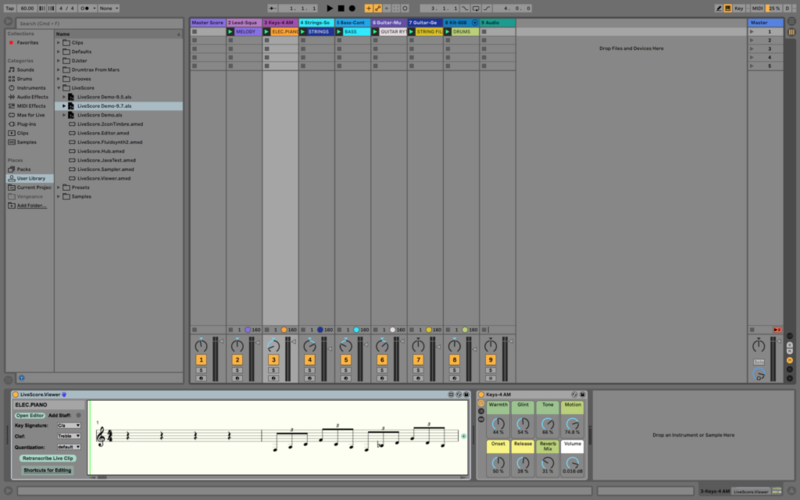 (Use the earlier versions if you haven’t upgraded to Ableton 9.7 or higher yet). You just opened a pretty cheesy arrangement of What a Wonderful World. In Live Session Viewclick on the track called 3-Keys-Acoustic-Piano. If everything went fine, you should be able to see the transcription of the piano accompaniment. The piece is in F major, so if it’s not already displaying it, choose the proper key signature from the Key Signature menu. You might find that it’s easier to read the line in bass clef, so select bass from the Clef menu. There are also a few quantization options ranging from quarter note-triplets to 32nd notes. In most cases, the default setting will yield a good enough result. Now, grab the scroll bar and scroll through the entire line. If you check the Auto Scroll button, the clip viewer will scroll and flash its notes automatically when you play back the piece. Now we are ready to change a few notes in the ELEC.PIANO clip. First let’s switch to Live’s Clip Viewwith shift-tab. Grab the first note and move it up an octave. When you go back to LiveScore, you’ll notice that the change you made is reflected in the score. 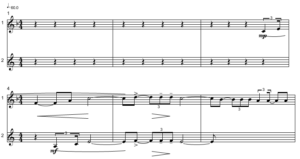 If you copy the first three notes and paste them at the beginning of sequence, those notes also immediately appear in the score. Of course, you can also change or add notes just with LiveScore Viewer without having to even switch to Clip View. Select the notes you want to alter and refer to Shortcuts for Editingfor a list of possible shortcuts (e.g. press “o” if you want to transpose your notes and octave higher). You can also use the mouse to add new notes by double-clicking (Mac and Windows) or ctrl-clicking (Mac). Let’s record a few new notes to a new clip. Right-click or ctrl-click on the track named “8 Kit-606 Classic-1” and choose Insert MIDI Track from the pop-up menu. You should see a new track called “9 MIDI.” Copy LiveScore Viewerfor instance by alt-dragging the device from another track onto the newly created track and right-click or ctrl-click on the first clip slot to insert a MIDI clip. You should see an empty MIDI clip which we’ll name FUN-WITH-SCORES. Just type cmd-R and enter the new name. Double-click on the MIDI clip to open the MIDI Note Editor, set loop length to a reasonable length, arm the track in the clip’s Mixer Section and start recording by clicking into the small triangle next to the clip name. Now use the computer keyboard or an external controller to record music. During recording you can switch to LiveScore Viewerand watch the notes being transcribed automatically. Once you’re done recording, you can quantize the music in the Live MIDI Note Editor. The quantize option in LiveScore Vieweris for display purposes only and doesn’t affect the timing of the notes!! What’s lacking in the Viewerare more advanced engraving capabilities such as adding dynamics or articulations. This is where the LiveScore Editorcomes in handy. Clicking on the Arrange button will take you now to the editor and its Staff Manager which lets you select the clips you want to include in your score (check the Add Staff toggle if you want to add the clip to an existing score). 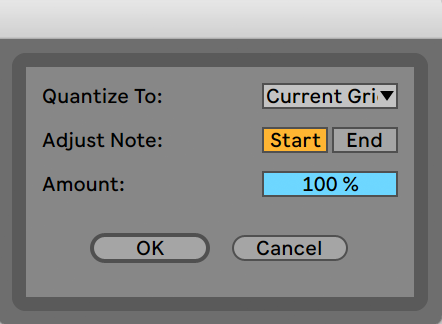 In order to edit a clip you’ll need to create a score first. This way, you’ll also be able to see the content of more than one clip at once and keep working with a rich score which may contain more expressions than the original Live clip (see Known Issues for potential caveats). To create a new score choose New Score from the File menu. This will create a score with a single measure; then open the Staff Manager by pressing the shift-2 or choosing Staff Manager from the View menu. In an instance, the Live clip will be transcribed and appear in the first staff. Press caps again to view the score. Let’s add another staff to the score by choosing Insert Staff from the Edit menu. You can switch to the Staff Manager by pressing shift-2, but you can also open it from the View menu. Lets now take a closer look at the Staff Manager. There are red buttons beneath the Transcription, Clef and Key Signature labels. There are two ways to trigger transcription: You can either perform a transcription affecting all staves that have been selected from the Live Clip menu (for this choose the Transcription Staff from the Edit menu) or a per-staff transcription by clicking in the grey circle next to the Transcribe button. When performing a “global” transcription, a clip will be excluded from transcription, if its transcription button is off (i.e. grey). This feature is very useful in case you want to add staves after you’ve already embellished one or several staves. The other two buttons next to the Clef and Key Signature menus toggle automatic clef and key signature assignment by gauging the distribution of notes in a clip. When percussion clef is selected, automatic assigment is off, even though the corresponding button is still red. Clefs and key signatures can always be selected manually after transcription. In case of guitar or double bass, the instruments sound an octave lower than written. Therefore, you want to set transposition to 12 (semitones) after transcription. Besides layout and scoring options (Spacing Above and Below as well as Staff Lines and Ledger Lines), the Staff Manager also offers the possibility to rearrange staves. For this, enter the target staff numbers into the Staff number box and select Sort Staves from the Edit menu. If a MIDI clip is inserted into or deleted from a Live clip slot, the Live Clips menu needs to be updated. Click on the underlined “Live Clip” label to update the menu. The result of transcription depends a great deal on the quantization settings. There are two places to set quantization, one in Live, the other in the MasterScore. For successful transcription it is crucial that the correct quantization has been set in Live first. For this, right-click (Win) or ctrl-click (Mac) on the piano roll grid on Live’s Clip View and make the appropriate choices. Then experiment with MasterScore’s quantization settings. 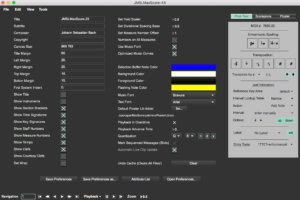 Choose Preference from the View menu and click on the Quantization menu. LiveScore Editor is sync’ed to Live’s transport, i.e. when you start playback, notes will flash and pages will turn automatically. You can turn this off by unselecting the corresponding items from the Playback Settings menu. You can also use LiveScore’s own playback engine which offers several playback modes to be selected from the Playback menu. This is particularly useful if your score contains microtones (Live itself doesn’t have microtonal playback capabilities). “Spell out” the loop in the actual clip. 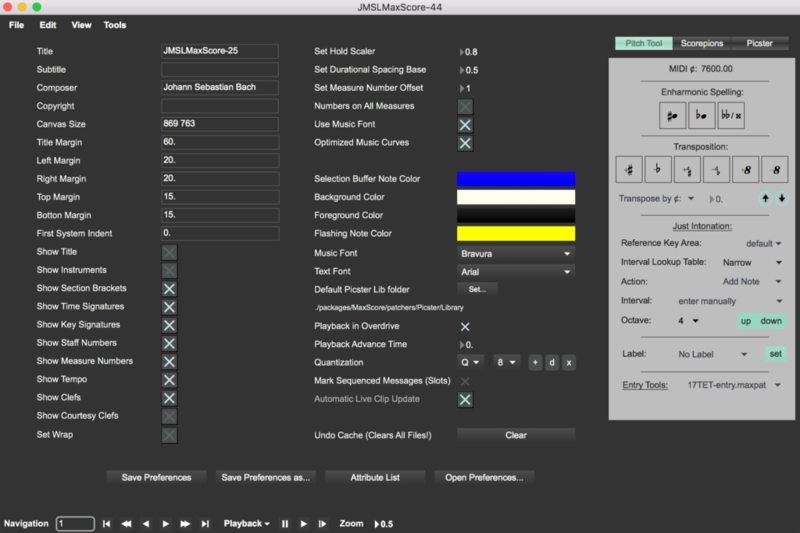 Recreate the loops in the LiveScore Editor and use its playback. Now we’re ready to edit our score. Duplicate the track “2 Lead-Square” and delete the MIDI clip. Click on the first slot and press cmd-shift-M to create an empty MIDI clip. Press cmd-R and name the clip MELODY2. Click inside the first track and switch to track view. 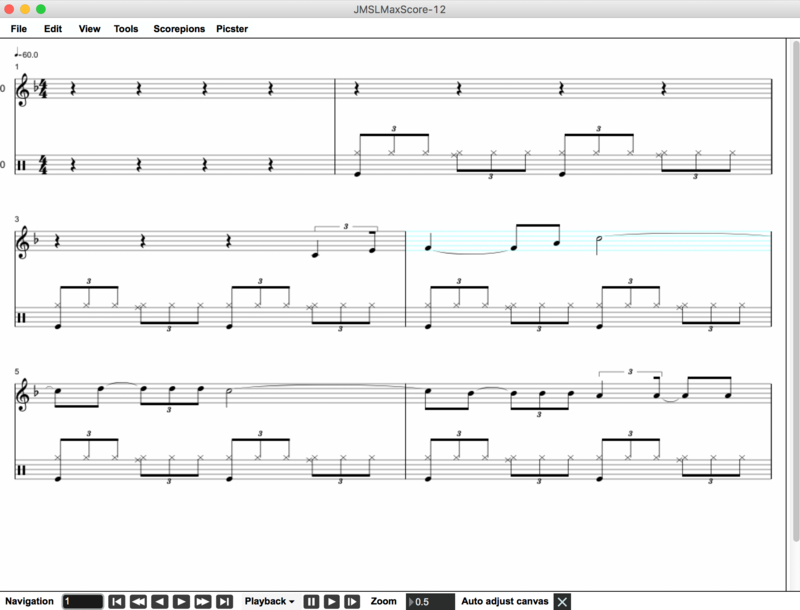 Open the score editor, create a new score, update the Live clip menu by clicking on “Live Clip“, insert a staff and transcribe clips “1 0 MELODY” and “2 0 MELODY2” to the first two staves. The first staff should be empty, the second should contain the melody of What a Wonderful World. 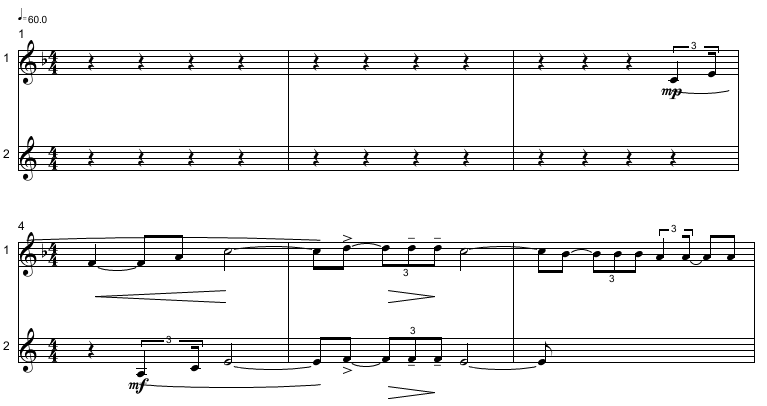 Copy and Paste Free Flow (see Edit menu) the first 8 notes to the second staff so that we create an imitation by a half note (see below). The new clip will automatically be updated as you add new notes to it, provided that Automatic Updateis turned on in Preferences (it’s turned off by default because frequent updating of large scores might slow things down a bit). Note: You’ll need to click on the first note and (with the shift key held) on last note of the selection (don’t try to shift-drag-enclose the notes). Choose Fill Empty Measures with Restsfrom the Scorepions menu and start embellishing the music by assigning dynamics, slurs, wedges and marks. Choose Commit to Live Set if you want the music to be included in the Live set (you’ll still need to save the Set though). It’s time to save your work. Choose Save Score from the File menu and save the score to your favorite folder. When you reopen the file by choosing Load File from the File menu, the corresponding Live clips will be auto assigned to their staves and you’ll be able to continue working on the score in sync with Live provided that you haven’t changed the MIDI clips in the meantime. Alternatively, you can commit the score to the Live set and enjoy being able to continue your work without having to load the MaxScore file separately after opening the set.